"My friend Breezes Babii was a friend of the owner of the Second Life Newspaper." said Gemma, "She introduced me to the owners." Dana Vanmoer, the editor, hired her after she and James Juno, the owner, interviewed her. "I felt terrible when they closed." said Gemma when asked about how she felt when the SL Newspaper closed. I asked Gemma about when she joined SL Newser. "Bixyl asked me to join him and I said yes along with another reporter not with us now," she told me, "So I feel like a co founder of the paper as reporter and Bixyl as my boss, editor, and have been with the paper since then." Gemma (gemma.cleanslate)'s greatest accomplishment would be the project with the SL kids. "I had friends who were SL kids and they were so misunderstood," she told me, "I believe that they are kids because of many reasons, wanted a better childhood or had a wonderful childhood. 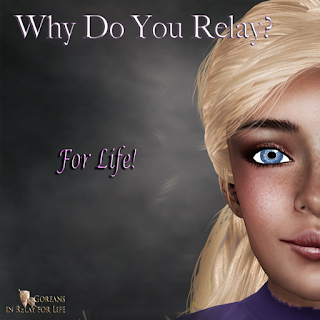 So I got a bunch of them together and they all wrote why they are SL children and we published all their stories." I asked Gemma if she will continue working at SL Newser. "Oh yes." she answered, "I try to do a article every two weeks tho sometimes they come in bunches (laughter). I do one and another pops up. I hope I can continue for a while at least." Gemma's goal with SL Newser is to improve the readership and make the articles interesting to the Second Life public so the readership grows and is informed. She went on to say that Bixyl Shuftan follows the news that affects the readership and write the main articles. She tries to keep him informed of the press releases and send them to him. But that's not all. Gemma looks at places and events that are interesting to the public. I asked Gemma if she is happy with the ways things are going with SL Newser. "So far so good." she told me, "But we need reporters who do more work." Aside from working at SL Newser, Gemma does fishing contests as a hostess for 7Seas fishing. She is usually at the Second Life Birthday celebration at this time as an exhibitor assistant but is taking the year off due to a health issue. She is active in the Relay for Life and helps out at different events for them. She also attends Philosophy class in Second Life under instructor Herman Bergson. She's very frugal in shopping and does all the lists for good bargains. I asked Gemma if she would say that she had reached her goal, and at the same time, found other goals too. "Oh yes always other goals." she answered. Gemma did have something to say before the interview was over. She says she misses Grey Lupindo. "I miss her. Real lfie issues took her away from the paper and Second Life," said Gemma, "She was a real contributor to the SLNewser until real life took over. ... She deserves mentioning. We (and Shelie Sands) were the four starters of the SL Newser." As the interview wrapped up, I thanked Gemma before leaving. I wish her all the luck in the coming months. I can't say about the others, but I believe that Gemma is an awesome reporter. I'm Gemma's friend and neighbour in SL and Gemma is a wonderful person besides being an awesome reporter.